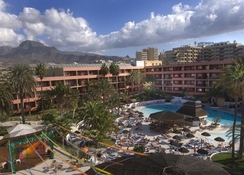 Hotel La Siesta is situated in the resort of Playa De Las Americas in southern Tenerife. Set in a location that is surrounded by gardens, this luxurious 4-star hotel offers outstanding services to its guests. 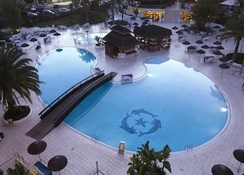 The hotel features two large outdoor swimming pools with a separate kids' section with plenty of sun beds and parasols. The little ones can also have fun at the kids' club. The hotel’s natural spa and wellness centre is a perfect spot for getting a massage, a Turkish bath and beauty treatments. Sports enthusiasts can head towards the gym or play tennis, volleyball or football. Leisure activities offered here are darts, billiards, and table tennis. Every night, the hotel's entertainment team presents live shows. 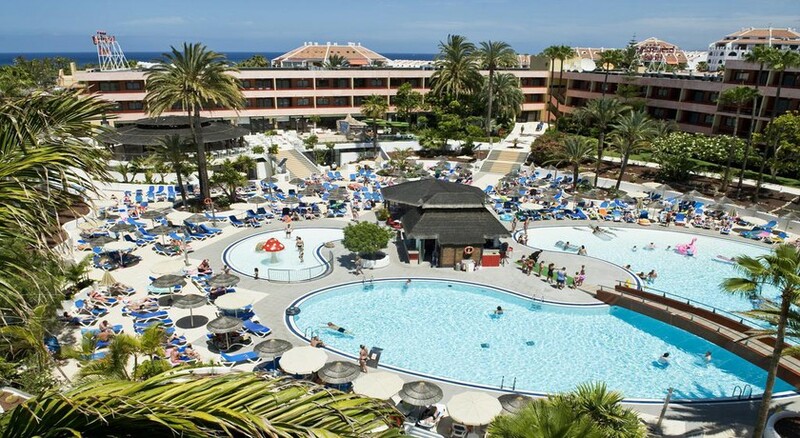 The hotel is located in the Playa De Las Americas Resort in southern Tenerife. The nearest beach is 300 metres away. The Tenerife-South Airport is 15.3 km while the Tenerife-North Airport is 61 km from the hotel. The Compostela Golf Course is 2 km from the hotel. Hotel La Siesta offers 282 spacious rooms across three floors in the main building. 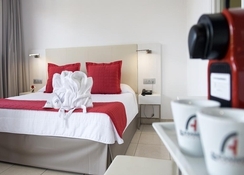 The modern rooms are tastefully decorated and provide a warm and peaceful atmosphere. All rooms are equipped with air-conditioning, furnished terrace or balcony, satellite TV with music channels, direct telephone, safety deposit box, mini-bar and lounge area. The rooms are categorized as: Standard Rooms, Club Alexandre rooms and Superior Club Alexandre rooms. Some rooms offer views of Mount Teide. Guests staying in the Club Alexandre rooms have free daily access to the spa. The Superior Club Alexandre rooms have a wonderful well-equipped Jacuzzi for 2 people. Guests receive a welcome gift for these rooms. Interconnected rooms, rooms for disabled, cots and king-size bed are all available on request. The main restaurant known as El Drago restaurant, serves breakfast, lunch, and dinner in buffet style. Exhibition cooking is also offered at mealtimes by the chefs at this hotel. A good variety of traditional and modern cuisine is served here. The restaurant’s policies include formal dress code for dinner. Themed evenings are arranged every week along with their respective cuisines. The El Bohío Snack bar located near the pools, serves a variety of salads, sandwiches and other light snacks along with refreshing drinks, juices, ice-cream and fruits. The La Palapa Bar located in the centre of the hotel serves teas, coffees, and cocktails, which can be enjoyed while watching the entertainment shows. The hotel features 2 outdoor swimming pools with a separate kid’s section. There are many loungers and parasols near the pools. The brand new spa and wellness centre offers sauna, Jacuzzi, Turkish bath, plunge pools, massage therapies, and hair and beauty treatments. These spa facilities carry a local charge. Sports and leisure activities include volleyball, tennis court (with charge), darts, billiards, floodlit and a five-a-side football court. Entertainment shows are held at every night, ranging from professional shows, dances and live music shows. For children (ages 2-9) there is a Magic Park kids club, which includes ball pools, slides, a theatre, etc. Also, there is Game Park for children of all ages. Activities at the game park are payable locally. All children must remain under their parent’s supervision while they stay at the Magic Park. My boyfriend and I wanted a quick getaway from the impending UK winter and this was perfect. Seconds away from the main strip with shops and restaurants, big convenience store around the corner, 5min walk from the beach, and great restaurants all walking distance. The room was spacious too. There were often loud events on in the bar at night which we could hear from the balcony but the doors and windows are sound proof with blackout curtains so no complaints. Would definitely come back. Had a fantastic time, hotel near everything, nice pool space. Clean room. However food was a bit of a let down. Options were not great. very good hotel with great breakfast, but we had a long walk down a long corridor to get to our room and sometime the key did not work and another long walk to reception so look out for these rooms as too far away , but handy for the pool, which we did not use! Pool area lovely, rooms nice and clean. Modern bathroom. The usual entertainment on the evenings not much of a kids club presence. Food ok but not great had better at 3 star places.